The Apple iPhone 6s has been certified by Chinese regulatory agency TENAA. 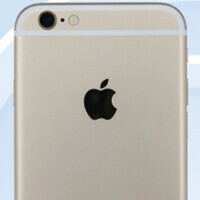 The agency cited the specs on its website, noting that the device is powered by a dual-core 1.8GHz CPU. A typo listed the phone as containing 4MB of RAM. The actual amount is 2GB of RAM, and the model that was certified contains 128GB of native storage. Of course, most of the iPhone 6s specs are well known by now, including the 4.7-inch display, carrying a resolution of 750 x 1334. The phone's measurements were said by the regulator to be 67.1mm x 138.3mm x 7.1mm. That is .2mm thicker than its predecessor. At 141g, the new model weighs 12g more than last year. The added thickness and weight are both most likely due to the 3D Touch technology stuffed inside the phone. After seeing all of those handsets from smaller Chinese manufacturers pose for their usual TENAA portrait, it is somehow strange to see the iPhone 6s say cheese to TENAA's photographer. The series of four photos can be found in the slideshow, below. The good news is that the iPhone 6s is now certified in China (as if there was any doubt) so that it can be released in the country on September 25th. 8 more days, till the test drive. Yes! I'm getting the 6S Plus in Black this time. Thinking Space Grey but not sure. How long will it take Walmart to get some in stock? Got a lot of gift cards save up for nice discount. My money was ready and then hot water heater went out. Always something throw monkey wrench in your plans. Same here. I'm watching the feedback. I was hoping for a quad core. At least 3 cores (from the iPad Air 2). No need for more than dual-core and 2gb of RAM on a basic device that'll only be used for Facebook, Instagram, and texting. If that's all you use a phone for then you don't need a high end phone. Even a mid range deice would be overkill for you. Don't waste your money on an iPhone then. You'll barely even tap into its abilities. really man??? ?, do you spend 1000$ to get a device that can run facebook and instagram ??? That would be an overkill..
That's called good design. It's a bit hard to find in Android. Not really. In fact, Apple design seriously lagged other flagships this past year. The iPhone 6 is the most comfortable to use design that's been released in years. Can easily use in one hand or two and has no sharp edges whatsoever. I very much disagree with this. I find the iPhone 6 to be less comfortable than the 5s due to how thin it is and the fact that the edges are rounded. Generally, when it comes to comfort, you want the back to be slightly rounded so that it conforms to the shape of your hand, and you want the edges to be flat so that you can grip it more securely. iPhone 5S was the best iPhone ever, 6 & 6S? not so much... i like S6 better... not to rounded nor to sharp, feels more compact despite it's larger screen. The antena lines on iPhone 6 was ugly, in terms of color i prefer black compared to space gray. It's only me or i think 5S feels more solid? It's the large bezels. Fancy af. It's the consumer effect. Apple is huge and the most popular so when you have one it feels like you're on the same level as everyone else and you have the best product. You know your Android is better, but in the back of your mind it's that part that wants to be like everyone else and look fancy. Happens to me when I hold my gfs IPhone too!